mz knits: i can do cables! i decided i wanted to learn how to knit cables. so...i picked up my sticks, surfed over to this neat-o site and got busy! it's SO much easier than i thought it would be. this example is made with pink red heart super saver yarn (100% virgin acrylic) on size 10 needles. 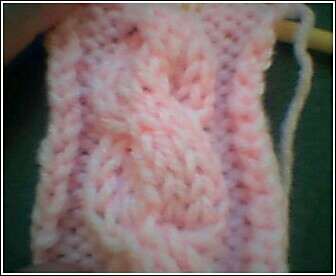 it's a six-stitch left-slanting cable, done over 14 stitches. i am just so impressed with myself right now. next thing i'll learn is how to do cables without cable needles!